The legendary Swedish team is back. 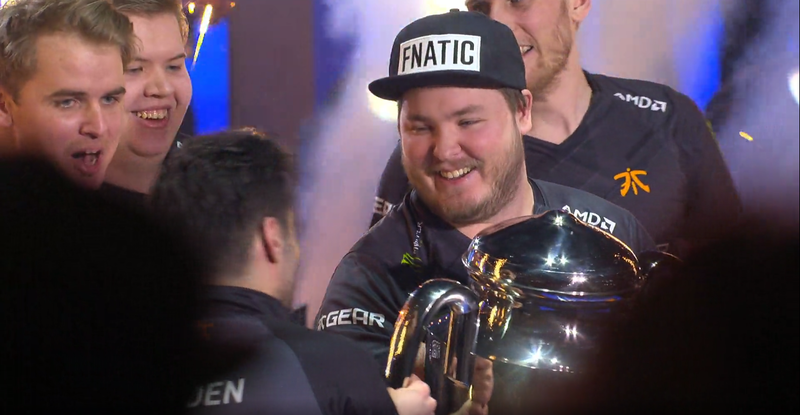 After five maps and seven hours of playtime, Fnatic have returned to Counter-Strike: Global Offensive stardom after defeating FaZe Clan in the IEM World Championship finals. Prior to the finals, both teams were seemingly on opposite ends of the spectrum—Fnatic, only 10 days prior to appearing in the grand finals, had their absolute worst showing ever in a LAN tournament during the StarSeries season four finals in Ukraine. Meanwhile FaZe, who coincidentally had their own share of troubles at the same event, were still considered the absolute best team in the world. For all intents and purposes, this seemed to hold true on the opening map of the series. Taking place on Cache, the game was a rematch of the upper bracket finals that Fnatic won. But once on the main stage of the Spodek Arena, FaZe showed absolutely no mercy against the Swedish team. Barring a loss in the opening pistol round, FaZe consistently destroyed any of Fnatic’s attempts at retaking either bomb site. It wasn’t only in the opening half that Fnatic appeared completely trounced, where FaZe grabbed 11 rounds, but the team quickly pounced on the Swedes in the second half, ending the map with an unceremonious 16-5 victory. For a while, it looked as if FaZe would be clearing out the building early, as the European superteam delivered another blistering performance on the opening half of Inferno. FaZe quickly amassed a comfortable lead off the back of a series of incredible holds by Nikola “NiKo” Kovač. It almost seemed all too easy for the tournament favorites, and even though Fnatic eventually recovered toward the end of the half, FaZe had historically showcased to be more than capable on either side. But similarly to FaZe’s quarterfinal match against Cloud9, the team couldn’t close the map out in regulation, as Fnatic surpassed them in rounds. Once in overtime, both teams consistently traded rounds—forcing the map into yet another overtime scenario. This time, however, Robin “flusha” Rönnquist and Fnatic finally got the rounds they needed and tied the series. Winning their first map pick by such a slim margin seemed to reinvigorate Fnatic, as the Swedes turned one of FaZe’s signature maps, Overpass, into a shooting range. Barring what is likely to be one of the most impressive clutches in CS:GO history from Ladislav “GuardiaN” Kovács, FaZe had no response against the Swedes on either side of the map. Instead it was Jonas “Lekr0” Olofsson who absolutely sealed the deal for Fnatic, as the rifler won nearly every single duel against FaZe—opening bomb sites with no issues whatsoever. Suddenly the tables had turned, and Fnatic were one map away from closing out the grand finals. This time, however, FaZe looked to have recomposed themselves, and set out with yet another dominant first half on Mirage. Although FaZe won both pistol rounds, Fnatic staged a minor comeback following an insane full-eco round victory against a bought up FaZe. It appeared that the tournament favorites were in the midst of experiencing a repeat of Inferno—but ultimately made good use of their lead, and shut down Fnatic with a 16-11 victory. Train remained as the final map of the tournament. FaZe were initially the team dictating the pace in the first half, as Fnatic trailed by quite a few rounds. The Swedes, however, brought the score to 8-7—which made the next half as even as possible for either side. Despite losing yet another pistol to FaZe, Fnatic quickly regained their composure after building up their bank. Instead, just like on Inferno, the Swedes quickly gained on their opponents. FaZe, however, were the first team to reach match point, but a second ace clutch by flusha saw the game veer into overtime. Like so many times before on Train, FaZe weren’t looking like the team that played in the first half, and Fnatic pushed past the tournament favorites to win their first major CS:GO event in over two years.